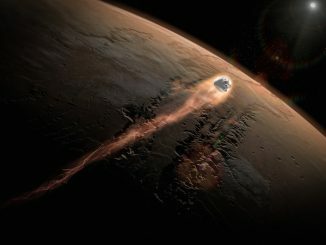 NASA has selected two robotic missions to visit asteroids in the early 2020s from a field of proposed interplanetary probes, approving projects to explore a metallic relic from the early solar system and a half-dozen so-called Trojan objects left over from the formation of the outer planets. The Lucy and Psyche spacecraft will join NASA’s line of cost-capped Discovery missions, a program under which the agency’s Mars Pathfinder rover, the Messenger mission to orbit Mercury, and the Dawn probe currently orbiting the dwarf planet Ceres were developed, built and launched. Picked from a slate of 28 proposals submitted to NASA in 2015, Lucy and Psyche will visit worlds never before seen close-up as scientists seek to sort out the violent early history of the solar system, in which proto-planets coalesced from mergers and collisions between rocks and boulders in a disk around the sun. Lucy will launch in October 2021 on a preliminary trajectory to escape the bonds of Earth’s gravity, then return for flybys to use the planet’s gravity to slingshot toward the mission’s targets in the asteroid belt and beyond. The probe’s first destination in April 2025 will be the asteroid DonaldJohanson, named for the paleoanthropologist who discovered the fossil of Lucy, a human ancestor whose partial skeleton was discovered in Ethiopia in 1974. The Lucy spacecraft will then head as far as 500 million miles (800 million kilometers) from the sun on a series of high-speed passes through groups of Trojan asteroids, primitive worlds trapped by Jupiter’s gravity in swarms ahead of and behind the giant planet’s path. Lucy will fly by at least six Trojan asteroids at close range from August 2027 through March 2033, the first time a spacecraft has visited a member of the Trojan population, which some scientists estimate may number in the hundreds of thousands of objects. The Jupiter Trojans may hold clues about the evolution of the solar system, especially the outer planets and the formation of Jupiter and its moons, scientists said. The frozen mini-worlds could be time capsules, keeping the characteristics they had more than 4 billion years ago, before scientists believe the immense pull of Jupiter’s gravity trapped them in their current locations. 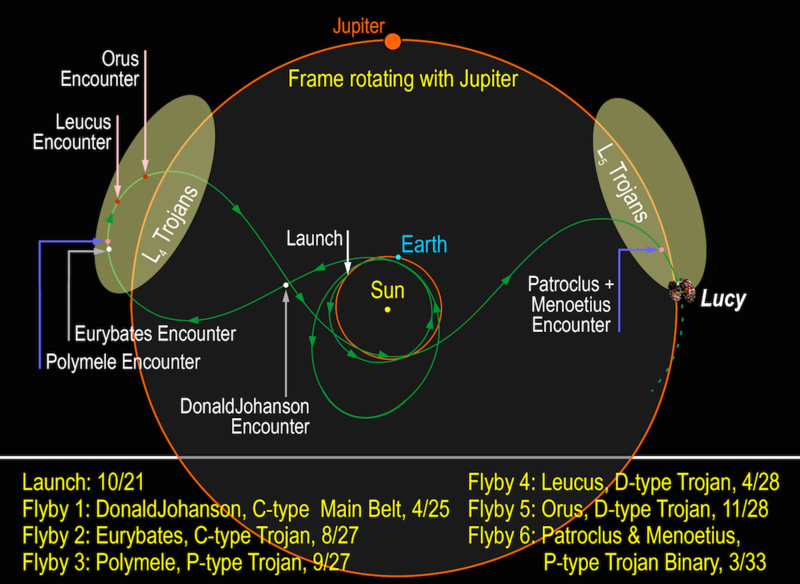 Because of their distance from Earth, fragments from the Jupiter Trojans have never fallen to the ground as meteorites, robbing scientists of any insight into their history and make-up. The Psyche mission, named for its destination, will depart Earth in October 2023. Its trajectory will take the spacecraft on gravity assist flybys around Earth and Mars in 2024 and 2025, then to the asteroid Psyche in 2030, where the probe will enter orbit for at least 12 months of detailed measurements and observations. Asteroid Psyche resides in the outer part of the main asteroid belt between the orbits of Mars and Jupiter, with an average distance of around 270 million miles (430 million kilometers) from the sun, three times farther than the Earth. Telescopic observations indicate Psyche is about 186 miles (300 kilometers) in diameter, but its topography and shape remain a mystery. Astronomical observations show that Psyche’s metallic composition is much like Earth’s super-dense, super-heated inner core, an environmental unreachable by humans or modern research tools. The Lucy and Psyche missions come with strict cost constraints imposed by NASA. 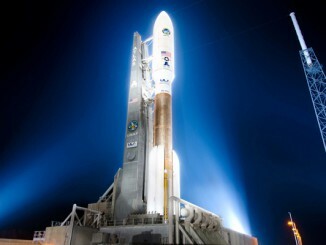 The space agency’s cost cap for the missions is $450 million each, a figure that does not include launch costs. Levison said the Lucy spacecraft will be built by Lockheed Martin in Denver and will be based on the company’s design of previous interplanetary probes, most recently the OSIRIS-REx asteroid sample return mission launched in September 2016. Space Systems/Loral of Palo Alto, California, will manufacture the Psyche spacecraft with a suite of ion thrusters to steer the probe toward its destination. 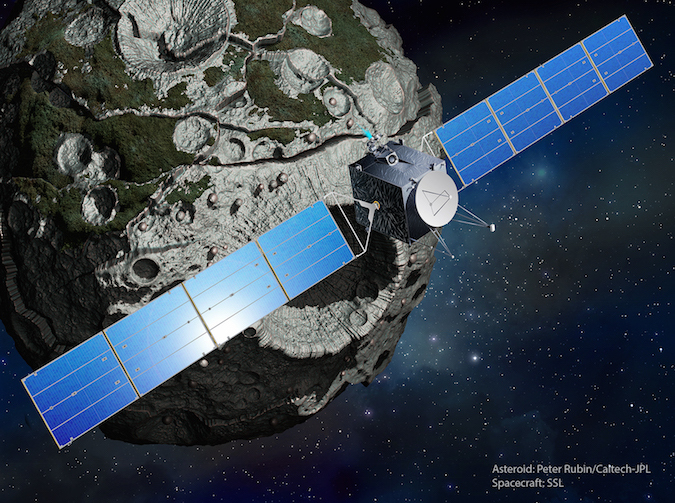 Based on the company’s 1300-series design for commercial communications satellites, Psyche is the first spacecraft SSL will build for a NASA Discovery-class interplanetary mission. Lucy will fly with conventional chemical rocket thrusters, relying primarily on gravity assists to bend its trajectory toward the Trojan swarms, Levison said. To be managed by NASA’s Goddard Space Flight Center and Jet Propulsion Laboratory, respectively, Lucy and Psyche came out on top in NASA’s evaluation of five finalists culled from a list of 28 initial proposals submitted to the agency in early 2015. The winning missions beat out two robotic probes that would have flown to Venus — an orbiter with a radar mapping instrument and a craft that would have studied Venus’s atmosphere during an hour-long parachute-assisted descent. A fifth finalist was called NEOCam, an observatory planned to search for asteroids that could threaten Earth. While NASA did not approve NEOCam for full development, officials plan to continue funding the mission’s team at JPL for at least another year, aiming to reduce risk and keep the project alive for a possible future selection. NASA picks Discovery missions in competitions among scientists with interests in the planets, asteroids, comets. Researchers are charged with assembling broad scientific and industrial teams that include developers of science instruments, spacecraft builders and project management experts. “In that competition, we’re looking for top science, top scientific implementation, and minimizing our technical risk,” said Jim Green, director of NASA’s planetary science division. “Each of the principal investigators have a cost cap they must be able to stay under. All these factors are folded into a comprehensive evaluation. Green on Jan. 11 told NASA’s Small Bodies Assessment Group, a committee of scientists specializing in research on asteroids, comets and dwarf planets, that the launch dates for Lucy and Psyche are staggered to fit within the agency’s planetary science budget and based on orbital mechanics. 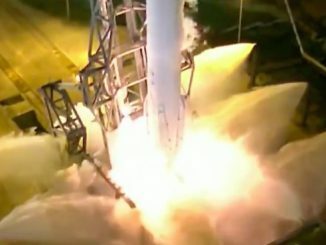 “These are the two that were the most technically ready, with top science,” Green said. Lucy will get a head start on its development, with its launch date set for October 2021. Psyche will follow a couple of years later. NASA has typically picked just one Discovery mission during each competition. The last Discovery competition resulted in the approval of the InSight Mars lander in August 2012, with a target launch date in March 2016. InSight’s seismic research mission to the Martian surface has been delayed due to technical issues, with launch now scheduled in May 2018. NASA is trying to reduce the time between Discovery-class missions, after the National Research Council recommended the agency mount competitions every two years, close to the cadence achieved earlier in the Discovery program in the late 1990s and early 2000s. But NASA’s planetary science funding waned over the last decade, and the agency’s relatively low-cost Discovery program suffered. More costly flagship-level science missions like the Curiosity rover also took up a large slice of NASA’s remaining planetary science budget. Green said NASA’s current budget allows for a new Discovery competition within three years, down from the four-and-a-half years between the selections of InSight and Lucy and Psyche. “The administration and Congress have approved a healthy program that can’t quite get us to 24 months, but gets it now closer to 32-36 months,” Green said Jan. 11.